Frederick Scott protests the killing of Michael Brown on August 18, 2014, in Ferguson, Missouri. Earlier this month, a police officer shot and killed an unarmed black teenager, Michael Brown, in Ferguson, Missouri. The shooting and the response have reignited concerns about racial profiling, police brutality and police militarization. The incident has also drawn attention to a remarkable lack of knowledge about a seemingly basic fact: how often people are killed by the police. The statistic might seem solid at first glance. The Centers for Disease Control and Prevention and the Bureau of Justice Statistics — independently of the FBI — also estimate the number of police homicides per year at around 400. But these estimates can be wrong. Efforts to keep track of “justifiable police homicides” are beset by systemic problems. “Nobody that knows anything about the SHR puts credence in the numbers that they call ‘justifiable homicides,’” when used as a proxy for police killings, said David Klinger, an associate professor of criminology and criminal justice at the University of Missouri who specializes in policing and the use of deadly force. And there’s no governmental effort at all to record the number of unjustifiable homicides by police. If Brown’s homicide is found to be unjustifiable, it won’t show up in these statistics. The FBI’s Uniform Crime Reporting (UCR) program, which compiles the SHR, relies on voluntary involvement of state and local police agencies — a fact that may raise some questions about the integrity of the data. But many UCR numbers are considered fairly reliable,1 particularly fatal crimes like murder and manslaughter, according to Richard Rosenfeld, also a professor of criminology and criminal justice at the University of Missouri, who studies crime statistics. The simple UCR database does have plenty of limitations. For one, the data has holes in it: Illinois, for example, changed its reporting guidelines in 2010 to comply with UCR methodology, and data is only available prior to 2010 for the state’s largest cities. And then there are cases like Dallas, which in 2007 quietly redefined what it considers an aggravated assault, lowering its violent crime figures in the database. Such discrepancies are a major problem for UCR reporting of non-fatal crimes. But the bigger issue is that the basic UCR reports don’t include any information on victims or offenders. That data is provided to the FBI via a separate form, also called the Supplementary Homicide Report (SHR). The circumstances of each death are supposed to be recorded here, with classifications like “gangland killings” (code 46), “lovers triangles” (code 40), and “felon killed by police” (code 81). Fewer local police agencies report SHR data than report standard UCR data. “Felon killed by police” refers narrowly to justifiable police homicides, and “unjustifiable homicide by police” is not a classification. This means it’s difficult to combine unjustifiable police homicides — which could be listed as crimes elsewhere in the database — with “justifiable” police homicides. Killings in federal jurisdictions, such as federal prisons or military bases, are not included in the database. The statement provided by an FBI spokesman, Stephen G. Fischer Jr., noted that the UCR and SHR databases aren’t quite comparable, though “agencies consistently report homicide data both on the [UCR] and in our more detailed SHR data.” Given these problems, the SHR’s “justifiable police homicide” number is not a useful approximation of how many people are killed by the police. One reasonably reliable statistic we do have is the number of Americans who die in homicides each year. This data can be found in the Centers for Disease Control and Prevention’s National Vital Statistics System (NVSS) and is based on death certificates.2 The NVSS includes the cause of death classifications “homicide” and homicide by “legal intervention”: the geneal equivalent of the SHR’s “justifiable police homicides” number. Some of those 3,000 deaths are police homicides, justifiable and unjustifiable — there’s no way of knowing how many. 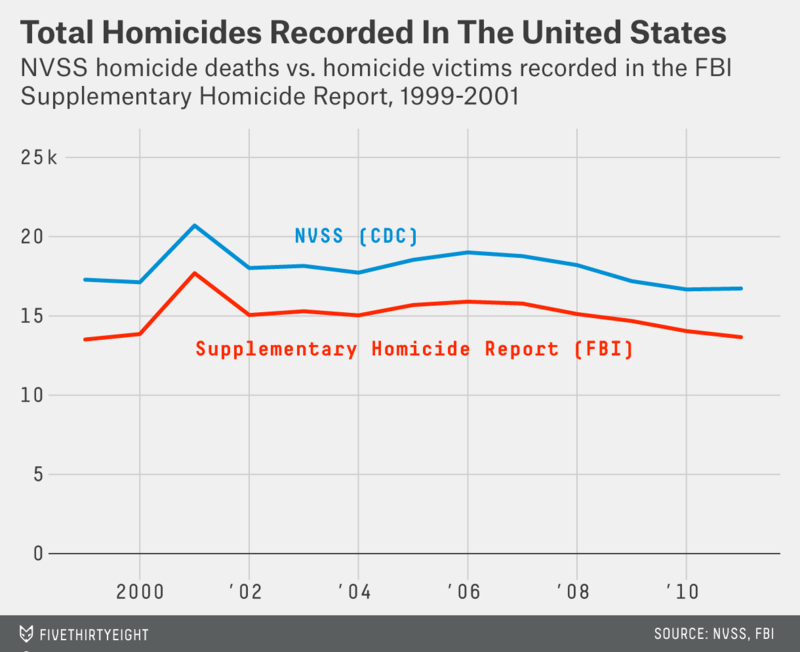 They also include other homicides that are not reported to the SHR but which have nothing to do with police involvement — for example, killings that occur in federal jurisdictions. It’s likely there are homicides recorded in the SHR that should be attributed to police as “justifiable” but aren’t. And, as I mentioned earlier, there’s an unknown number of unjustifiable police homicides that aren’t marked with any evidence of police involvement. Account for all that, and you would have the true number of police homicides each year. CLARIFICATION (Aug. 20, 1:15 p.m.): We’ve added a note to clarify that the “legal intervention” homicides tracked by the National Vital Statistics System include legal executions. While crime reporting isn’t required by the federal government, the FBI estimates that 95 percent of the population is served by a police agency that reports data. Reporting to this database is mandatory and its figures are comprehensive. This figure includes legal executions at an average of 60 per year over this span. We can’t trust BJS, either. In the agency’s own report on “arrest-related deaths,” which included a category for homicides, the researchers stated: “Arrest-related deaths are under-reported. BJS did not attempt to estimate for partial or non-responding jurisdictions. Data are more representative of the nature of arrest-related deaths than the volume at which they occur.” The BSJ has since suspended the study to examine its methodology. 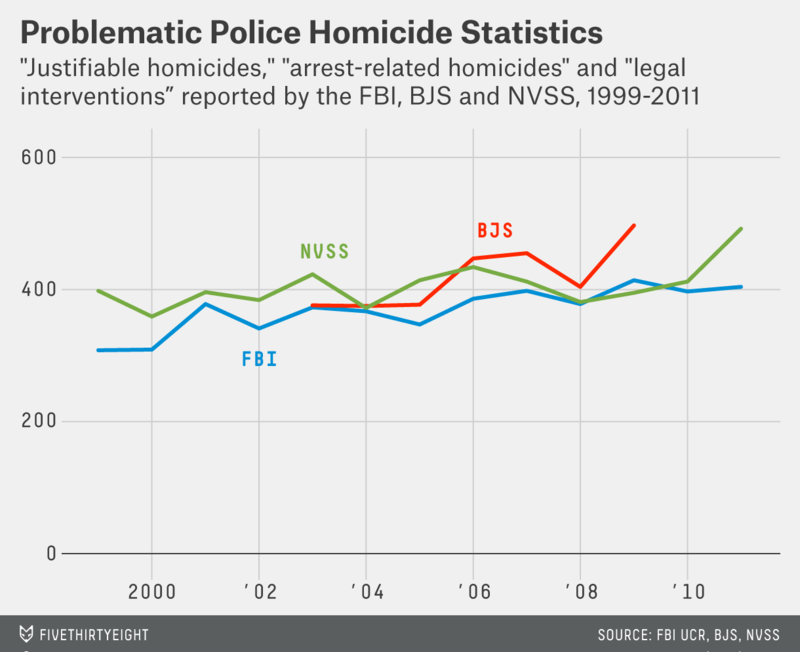 These data series are very similar: In 2004, for example, the FBI counted 367 justifiable police homicides, the BJS counted 375 arrest-related homicides, and the CDC counted 372 legal intervention homicides. This is not evidence that these counts are accurate, but implies that they fall victim to similar systemic biases in data collection. Note that for some entries in the SHR, multiple victims are associated with each incident. The number of homicide victims for each SHR year is calculated as the number of rows in each dataset — each row represents at least one victim — plus the sum of the “additional victims” column; V31. This gap was consistent over the 13-year span — evidence that the SHR data may be useful for establishing trends in justifiable homicides. Rosenfeld echoed this point, and Klinger also considered it useful for establishing minimum counts of such homicides.